Gleneagles, the world-famous hotel and sporting estate, has today unveiled two special commemorative golf packages, only available during the month of May, to coincide with centenary celebrations for The King's and The Queen's courses. 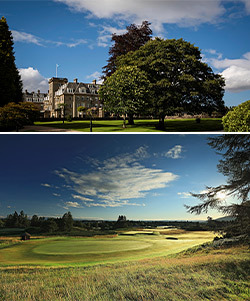 1 – The 'Regal Rounds’ package includes an overnight stay at the iconic Gleneagles Hotel. 2 – Visiting golfers can experience The King's Course, during a strictly limited period, for £100.